. Kohli remained unbeaten on 157 from 129 balls. This is how the cricket world reacted to King Kohli’s amazing feat. ICC: 10,000 ODI RUNS! @imvKohli reaches the milestone in his 205th ODI innings - 54 innings quicker than @sachin_rt. Simply outstanding! Sachin Tendulkar: The intensity and consistency with which you bat is just amazing. 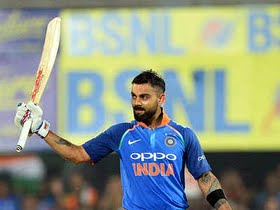 @imVkohli, congratulations on achieving 10,000 runs in ODIs. Keep the runs flowing. Mohammad Kaif: Congratulations #KingKohli on becoming the fastest to 10000 ODI runs. What a player! Ashwin Ravichandran: Switch on the TV, @imVkohli is batting on 144 having crossed the collosal 10k run mark. Double it up now as they would be calling for it in the dressing room. Tilan Samaraweera: Take a bow @imVkohli Congratulations for completing 10000 runs in white ball. What a breathtaking way to complete the milestone in 205 matches.